Sonia and her family are featured in the RSL Museum, dedicated to immigration and the RSL. The Museum knows of about six surviving RSL passengers, of whom Sonia is one. 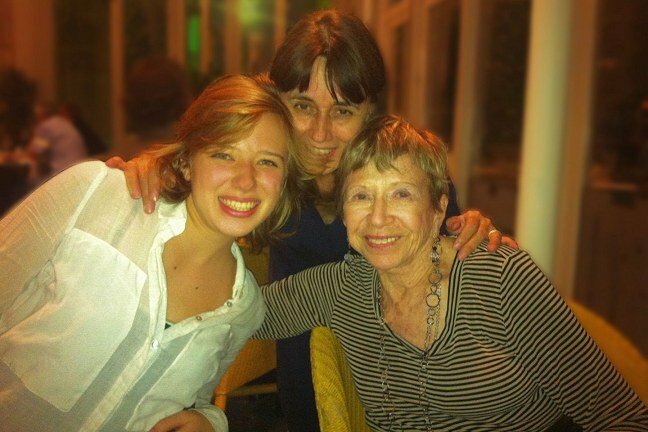 See The Jewish News of Sarasota-Manatee (Vol. 41, No. 2, Feb. 2011) for an article about this. 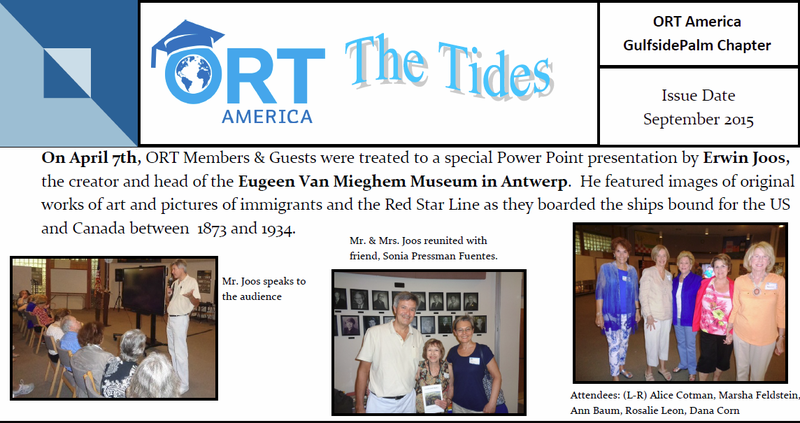 On Aug. 6, 2011, Philip Heylen, then-Antwerp’s vice mayor for culture and tourism, gave a talk entitled “Antwerp to America: The Red Star Line and Jewish Immigrants,” to Sonia’s congregation, the Congregation for Humanistic Judaism, in Sarasota, Fl, which focused on Sonia and her family. On August 6, 2011, at the Congregation for Humanistic Judaism program at the Unity Church, Sarasota, FL, Sonia introduced the speaker, Philip Heylen, vice mayor for culture, tourism, and public worship of Antwerp, Belgium, whose speaking engagement she had arranged. The Red Star Line Museum’s website is at http://www.redstarline.be/en. Read about Sonia and her family on that website. Click here to read Sonia’s speech at the international press conference on Sept. 24, 2013, in connection with the opening of the RSL Museum. Sonia was the only surviving RSL passenger present at the week’s festivities in connection with the opening of the Museum. 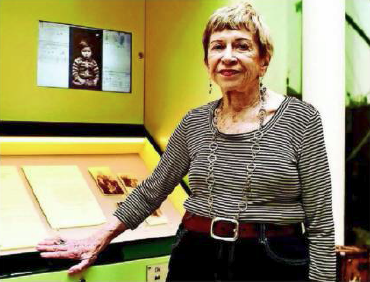 On Feb. 6, 2015, Sonia was interviewed by Christa Whitney, director of the Yiddish Book Center's Oral History Project, for about two hours. You can see a 7-minute videotaped excerpt of that interview dealing with the Red Star Line and the Red Star Line's Museum. In commemoration of International Women's Day on Mar. 8, 2017, the Red Star Line Museum posted a picture of Sonia as a little girl in Berlin, Germany and a write-up on its Facebook page and on its other social media outlets. Sonia was mentioned in a New York Times article of May 27, 2016, about the Red Star Line Museum's opening of an exhibit on Ellis Island during the summer of 2016. On May 26, 2016, the Red Star Line Museum had opening festivities for the opening of its exhibition on Ellis Island. The exhibition opened to the public on May 27, 2016, and will be there until Sept. 4, 2016. Sonia's great-niece, Debra Gold Linick, and other members of the family of Sonia's brother, Hermann, attended the opening festivities. Debbie's pictures, which follow, include pictures taken of the 3 1/2-minute film made by Mario De Munck, a filmmaker retained by the the Red Star Line Museum, made about Sonia. Sonia's write-up appeared on the Facebook page of the Red Star Line Museum commemorating the 81st anniversary of the arrival of Sonia and her immediate family to the U.S. on the Red Star Line on May 1, 1934. The Oct. 17, 2014, issue of Deus Ex Machina, a literary magazine written in Flemish and distributed in Belgium and The Netherlands, included two excerpts from Sonia’s memoir, “Accidental Birth” and “If You Speak His Language” and three pictures of Sonia—alone, with her brother, and with her brother and her parents. “Tsunami Woman,” an article about Sonia that went online on April 21, 2014, on an international website, the Missing Slate. “Life Boat,” by Franklin Crawford, Cornell Alumni Magazine (March/April 2014, pp. 22-23). Class Notes, Class of 1950, Cornell Alumni Magazine (March/April 2014, pp. 63-64). "Red Star Line: The ship that saved Albert Einstein's life?" by Sheena McKenzie, CNN, October 22, 2013. Click on each of the fourteen numbers under the painting at the beginning to see the photographs, including those of Sonia and her family. "Antwerp’s New Red Star Line Museum Brings History of Belgian - U.S. Immigration Alive," by John Stone, travelagentcentral.com, October 22, 2013. "Belgian museum pays tribute to Europe's emigres," by Raf Casert, Associated Press, published in The Philadelphia Inquirer, October 13, 2013. "A passage to America," Associated Press, published in The Hindu, September 29, 2013. 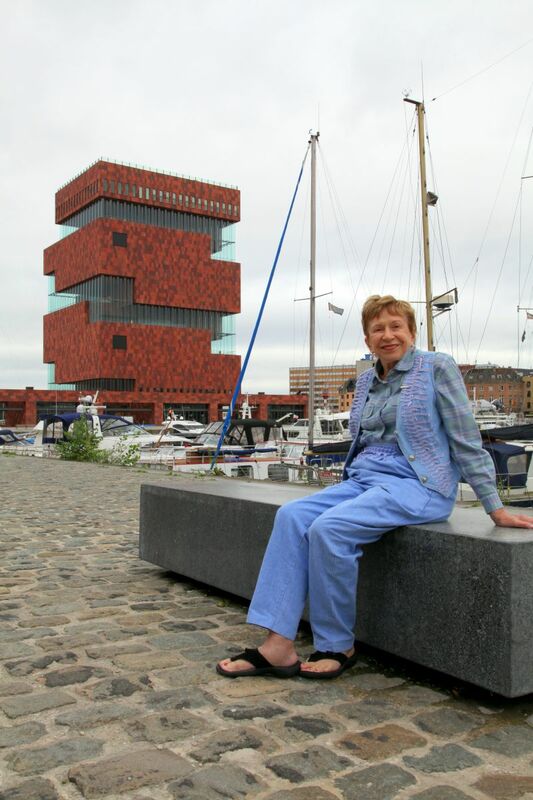 "Red Star Line Museum In Belgium Marks Journey To Americas By Famous Immigrants Escaping Nazi Rule," by Raf Casert, Associated Press, huffingtonpost.com, September 28, 2013. By Raf Casert, Associated Press, "Belgian museum shows travel could be life or death," Miami Herald, September 28, 2013. "Belgian museum tells tale of huddled masses steaming to America," by Yves Herman; editing by Kevin Liffey, Reuters, September 26, 2013. 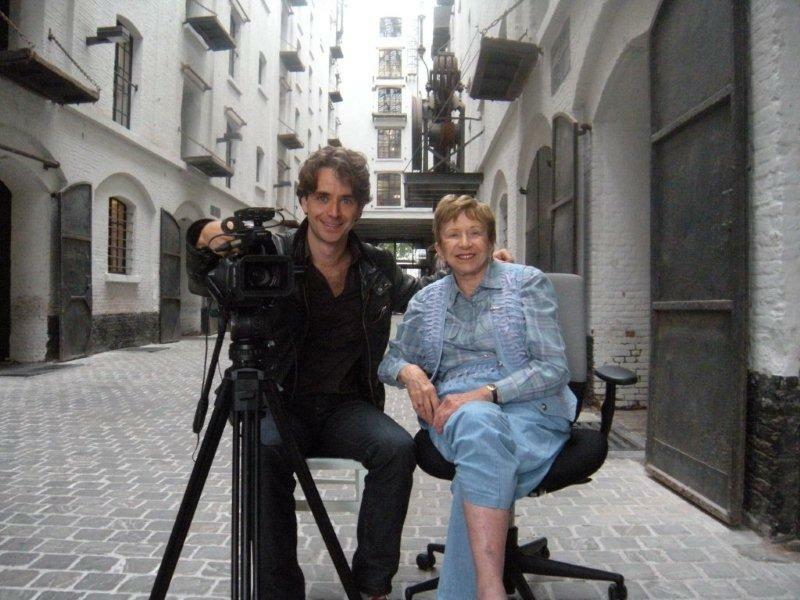 "Feminist returns to Belgium, site of Holocaust escape," by Billy Cox, Sarasota Herald-Tribune, September 23, 2013. 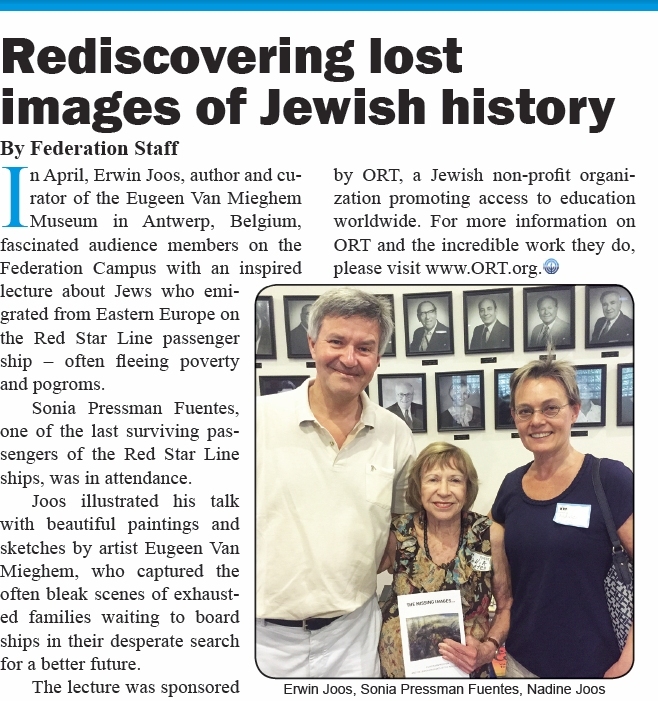 By Sarah Ida Tedesco, “Sonia Pressman Fuentes and the Red Star Line,” The Jewish News of Sarasota-Manatee (Sept. 2013, Vol. 43, No. 9, p. 12A). 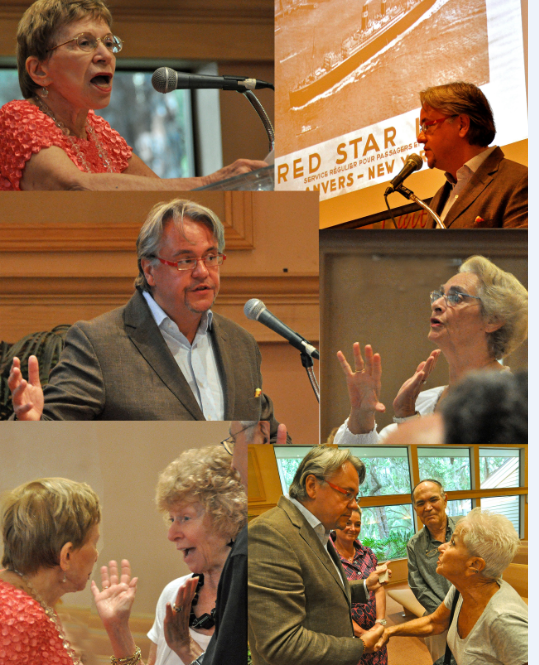 "The Red Star Line Museum: A Story of Immigration," July 15, 2013. 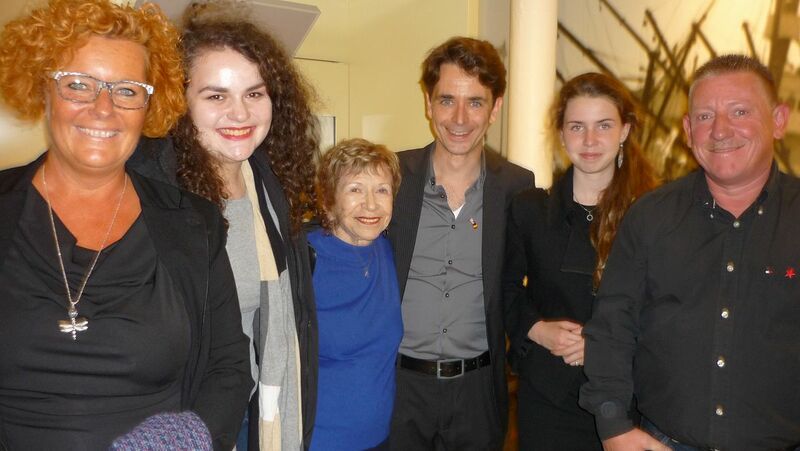 Article by Talia Weisberg, a young woman whom Sonia mentors, about the Red Star Line Museum. "Belgium Museum Will Tell Story of Red Star Line That Carried Jews to America," by Molly Arost Staub, The Jewish Daily Forward, June 4, 2013. Sonia, her parents and brother in the 1930s are shown in the lower right-hand side picture. This is page 18 from the booklet, Red Star Line Museum, People on the move, published by the Red Star Line Museum, due to open in Antwerp, Belgium, on Sept. 28, 2013. January 12, 2012, article by Chris Snick, in Antwerp, Belgium, newspaper, Het Nieuwsblad, about Sonia’s efforts to have Robert de Foy removed as one of the “Righteous Among the Nations” by Yad Vashem. By David Shariatmadari, "Divine dispatches: a religion roundup," theguardian.com (Jan. 11, 2012.). Scroll down to see the article about Sonia. By Paul Berger, "When 'Savior of Jews' is Deeply Flawed," January 09, 2012. (Article includes a slide show about Sonia.) The article, which deals with Sonia’s Sept.-Oct. 2011, request to The Righteous Among the Nations Department at Yad Vashem in Israel to remove the late Robert de Foy, former director of the Sûreté Publique (like America’s FBI), from those recognized as Righteous, was picked up by newspapers in Belgium, Canada, and France. An article about the same subject appeared on Feb. 8, 2012, in Dutch in Joods Actueel, a monthly newspaper directed to Jews in Belgium. By letter of Feb. 4, 2013, The Righteous Among the Nations Department advised Sonia that “after painstaking examination,” her request was denied. Article published in De Nieuwe Antwerpenaar magazine in Antwerp, Belgium in mid-Oct. 2011. In 1933-34, Sonia and her brother, Hermann, were pictured at the City Park of Antwerp. The editor of De Nieuwe Antwerpenaar found the location, had his photographer, Dries Luyten, take a picture of Sonia in the same spot on Sept. 13, 2011, and juxtaposed the two pictures in this photo. 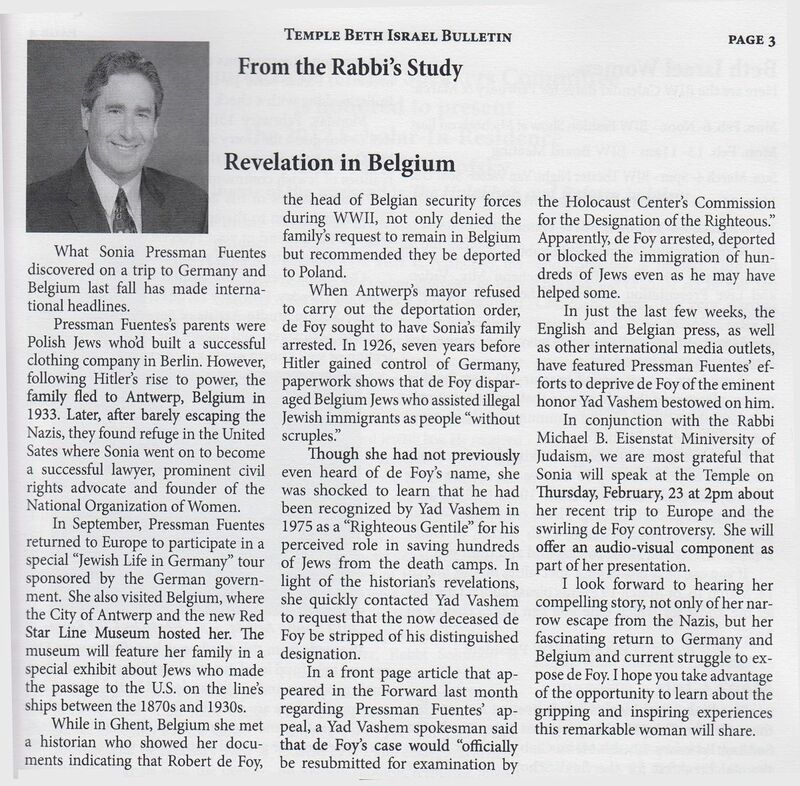 October, 2011, article by Frans L. Van Den Brande, in Belgian Jewish magazine, Joods Actueel. Letter from Philip Heylen, vice mayor for culture and tourism of Antwerp, Belgium, September 19, 2011. Article published in Antwerpen Stad in Antwerp, Belgium in September 14, 2011, p. 16. Article published in De Nieuwe Gazet in Antwerp, Belgium in September 14, 2011, p. 18. Article published in Het Nieuwsblad in Antwerp, Belgium in September 14, 2011, p. 31. Interview of August 5, 2011, on Sarasota Community Radio Station WSLR of Philip Heylen, vice mayor for tourism and culture for Antwerp, Belgium. By Masha Leon, "A Golden Anniversary," The Jewish Daily Forward, October 5, 2009. When Sonia read this column, she wrote the Red Star Line (RSL) Museum staff telling them that she came to the US on the S.S. Westernland, an RSL ship. That was the beginning of her relationship with the RSL Museum. Email from Luc Verheyen, project director, Red Star Line Museum, to Sonia on Nov. 17, 2013. As you know, your cooperation with the museum has been very important to us. In the first place, because yours and your family’s journey through Antwerp to a new and save life in the US, is a very interesting one that brings together many aspects of the wider RSL story of millions of other passengers. Your crossing in 1934 was one of the last on the proper RS Line, the story of your family is very well documented thanks to your brother’s diary, the police files we discovered with the help of Frank [Professor Frank Caestecker, University of Ghent] in Brussels, and the fact that you are still there to give that family history a personal and actual meaning. You and the remarkable things you have done would have never existed without all what happened between your brother’s decision to leave Nazi Germany for Antwerp, and your family’s arrival in the US. For all these reasons, you became one of the ‘crown witnesses’ in our permanent exhibition. We are very grateful for this and hope to see you back soon! Very best regards from a chilly and wet Antwerp! 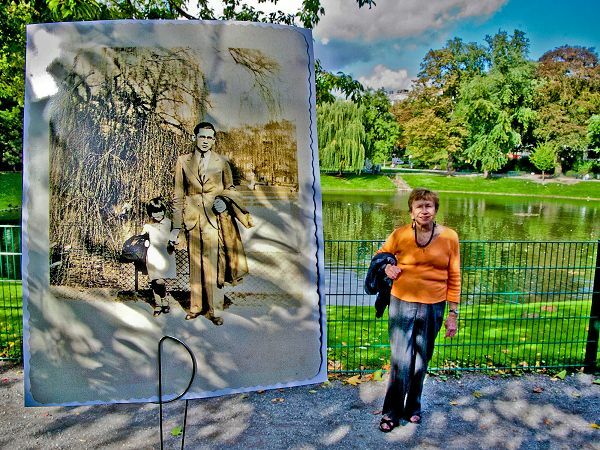 Picture of Sonia with her late brother, Hermann, taken in Antwerp’s City Park in 1933-34 juxtaposed with one of her at the same spot on September 13, 2011. 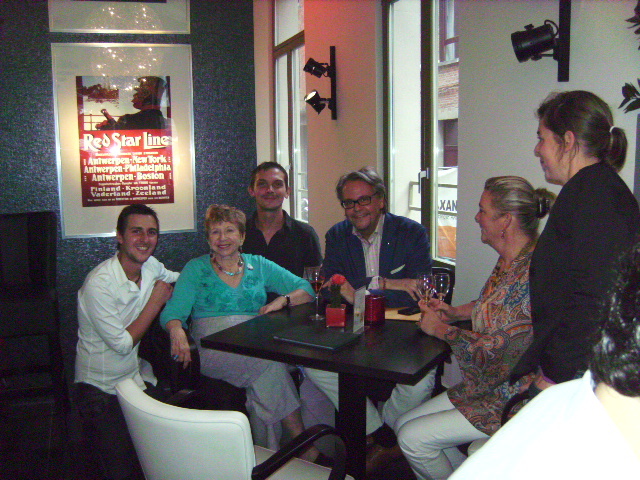 Sonia at the Red Star Café in Antwerp, Belgium, September 11, 2011. 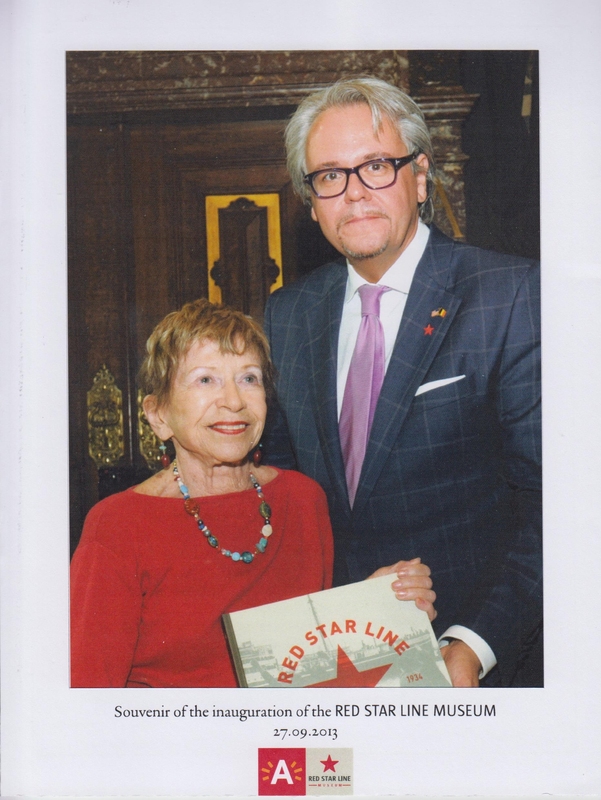 Sonia with Philip Heylen, vice mayor for culture and tourism for Antwerp, Belgium, at the inauguration of the Red Star Line Museum, September 27, 2013. 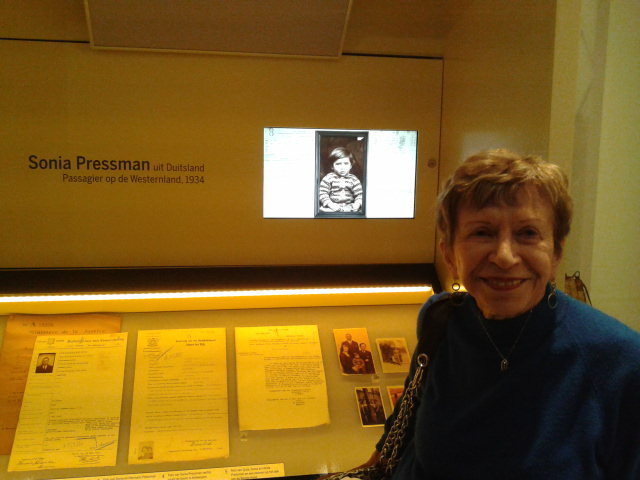 There is a slide show of photographs of Sonia's trip to Belgium (with a one-day visit to Amsterdam in the Netherlands) in September of 2013 to participate in the opening of the Red Star Line Museum in the Slide Shows subsection of the Fuentes Photographs section. 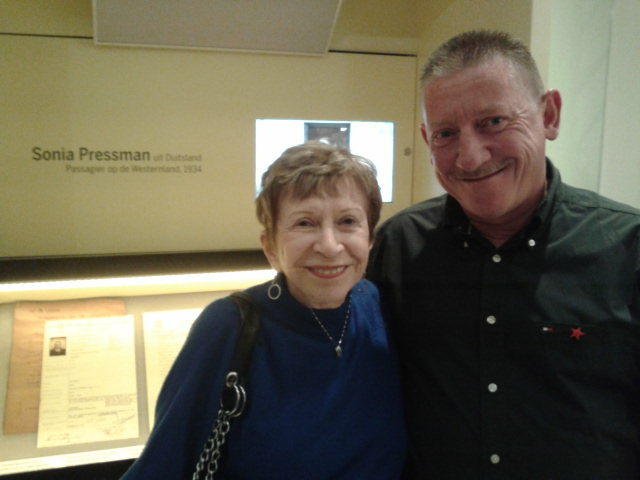 Sonia and Marcel (her driver) in front of the exhibit about her and her family at the Red Star Line Museum, week of Sept. 23, 2013. Sonia in front of the exhibit about her and her family at the Red Star Line Museum. In the background is a picture of Sonia as a child. Week of Sept. 23, 2013. 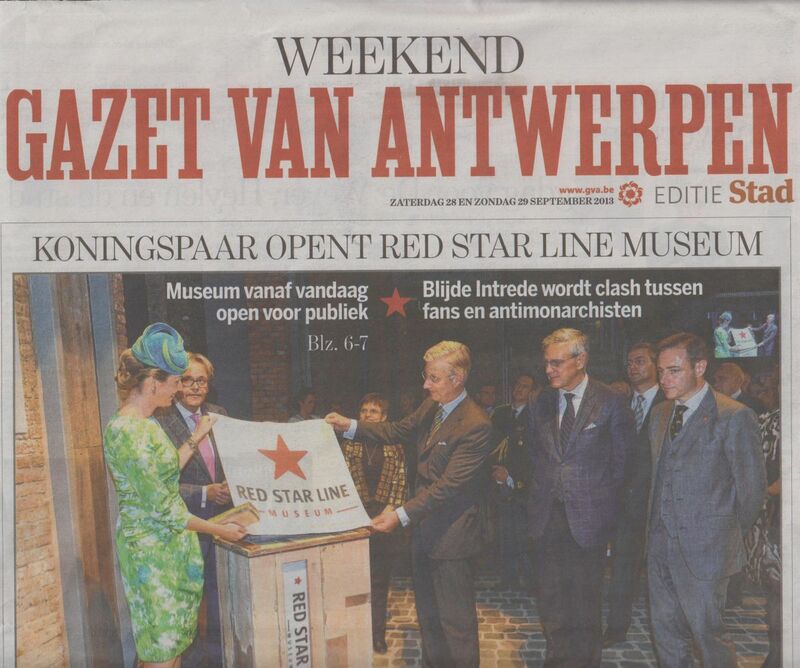 Picture taken Sat., Sept. 28, 2013, in Antwerp, Belgium in connection with the opening of the Red Star Line (RSL) Museum that day. 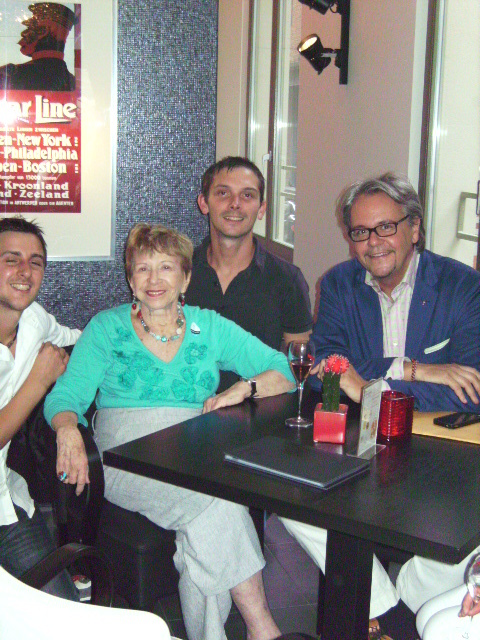 From left to right are: Danielle (wife of Sonia’s driver, Marcel), Alisa (young woman Sonia met in Dresden, Germany in Sept. 2011 who came to be with her in Antwerp), Sonia, Mario (filmmaker retained by the Red Star Line Museum to make the film that is part of the exhibit on Sonia and her family at the RSL Museum), Mario’s daughter, Roxane, and Marcel. Sonia and Mario De Munck in front of the exhibit about Sonia and her family at the Red Star Line Museum, week of Sept. 23, 2013. Sonia in front of the exhibit about her and her family at the RSL Museum. 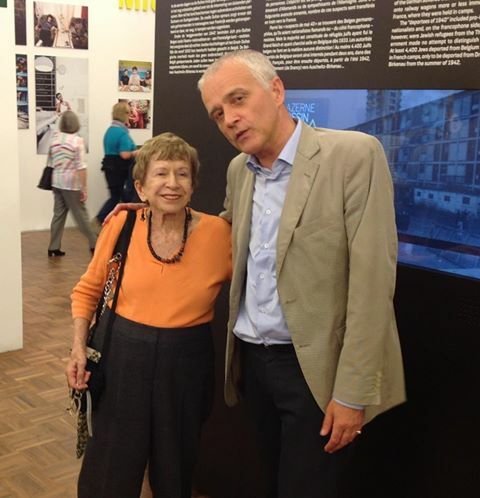 Sonia with Professor Herman Van Goethem, head of the Memorial, Museum and Documentation Centre on Holocaust and Human Rights in Mechelen, Belgium, September 26, 2013. 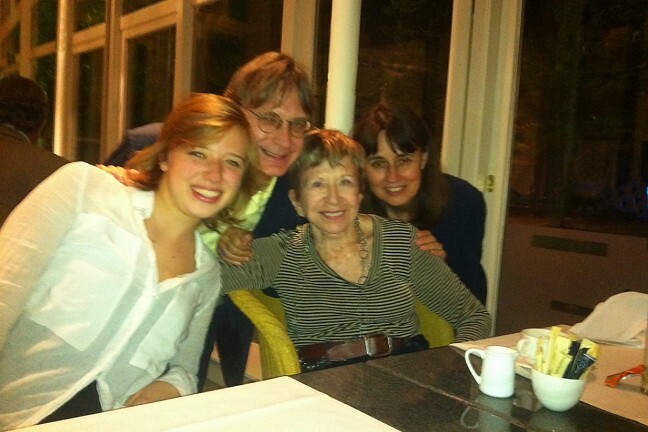 Sonia with Tim and Marie-Louise Ryback and their daughter, Audrey, at the Antwerp Hilton Hotel dining room, night of Sept. 23, 2013. Sonia with Erwin Joos and his significant other, Nadine Trahé, in front of Sonia's condo, April 15, 2014. Erwin is the director of the Eugeen Van Mieghem Museum in Antwerp, Belgium. Erwin is holding Sonia’s memoir and Sonia is holding one of Erwin’s books. Van Mieghem (1875-1930) was an Antwerp painter who painted the immigrants boarding Red Star Line Museum ships for the U.S. and Canada. About a quarter of these immigrants were Jews. 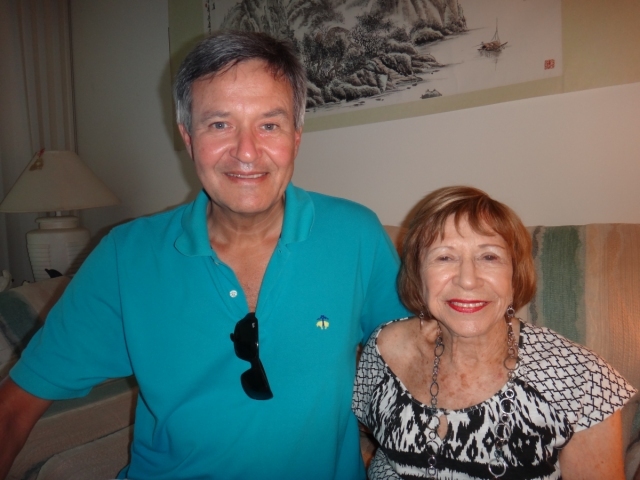 Sonia with Erwin Joos, founder and curator of the Eugeen Van Mieghem Museum in Antwerp, Belgium, at her Sarasota, FL condo, April 6, 2015. 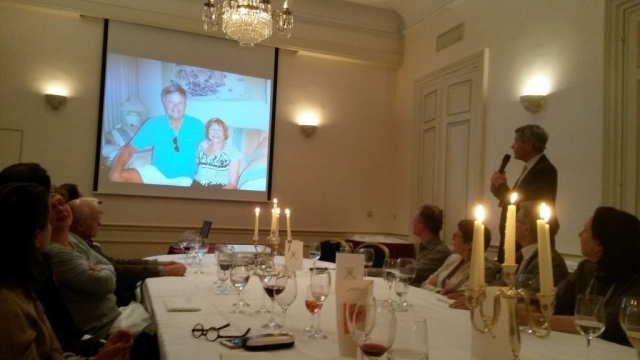 On May 15, 2015, Erwin started his presentation in Brussels, Belgium about the Eugeen Van Mieghem Museum by showing his picture with Sonia taken at her condo on April 6, 2015. 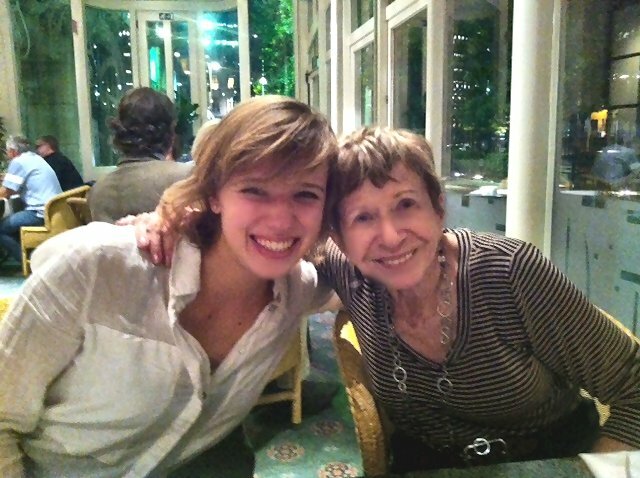 Sonia with Nadine Trahé, Erwin Joos's significant other, at P.F. 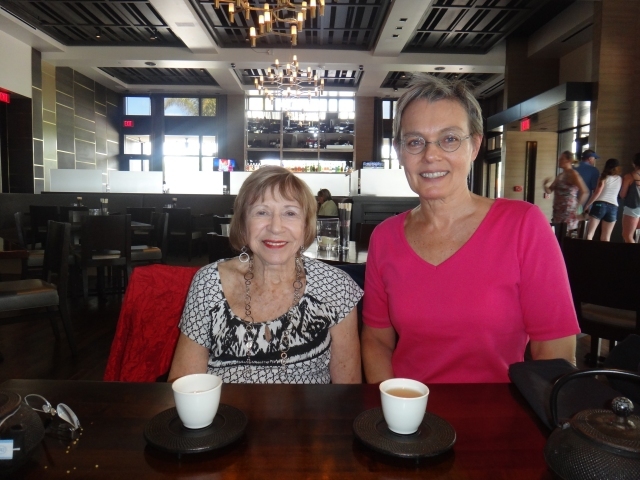 Chang's restaurant, Sarasota, FL, April 6, 2015. If you click anywhere in this paragraph, it will take you to the newsletter written in Dutch for June through August 2015 by Erwin Joos, founder and curator of the Eugeen Van Mieghem Museum in Antwerp, Belgium, to the members of the Eugeen Van Mieghem Foundation. The newsletter can't be enlarged by clicking on it, but it will enlarge so as to be more legible if you print it. In the second paragraph, Joos discusses Sonia and the Red Star Line. 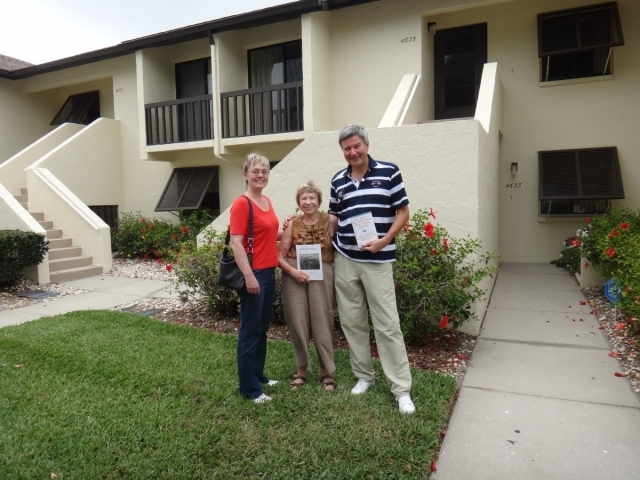 If you scroll down in the newsletter, you can see the July 2015 article from the Jewish News of Sarasota-Manatee with a picture of Sonia, Erwin, and Nadine Trahé (his significant other). This picture, taken September 27, 2013, shows King Filip and Queen Mathilde of Belgium, each holding a flag about the Red Star Line Museum at the Museum. Next to the queen is Philip Heylen, vice mayor for culture of Antwerp. Shortly after this picture was taken, the king and queen met, shook hands with, and chatted briefly individually with Sonia and seven other Americans whom they had asked to meet. The eight Americans were lined up as a receiving line and the king and queen walked by and stopped to talk with each of them. Gazet Van Antwerpen (Sept. 28-29, 2013). 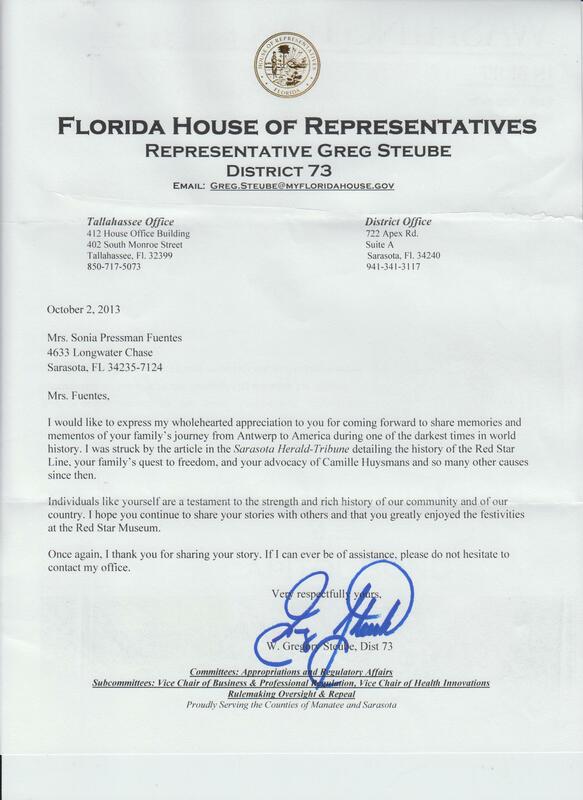 Oct. 2, 2013, letter from W. Gregory Steube, member of the Florida House of Representatives for Sarasota, expressing his appreciation for Sonia’s and her family’s experiences in journeying from Antwerp, Belgium to the US. 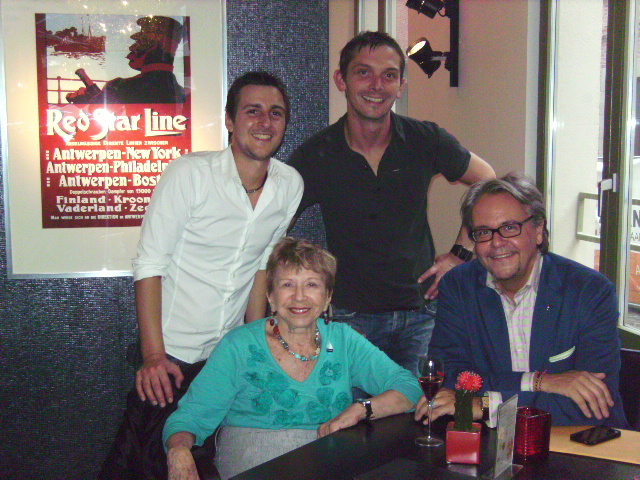 "Laatste overlevende Red Star Line op bezoek," ATV Nieuws, September 26, 2013. 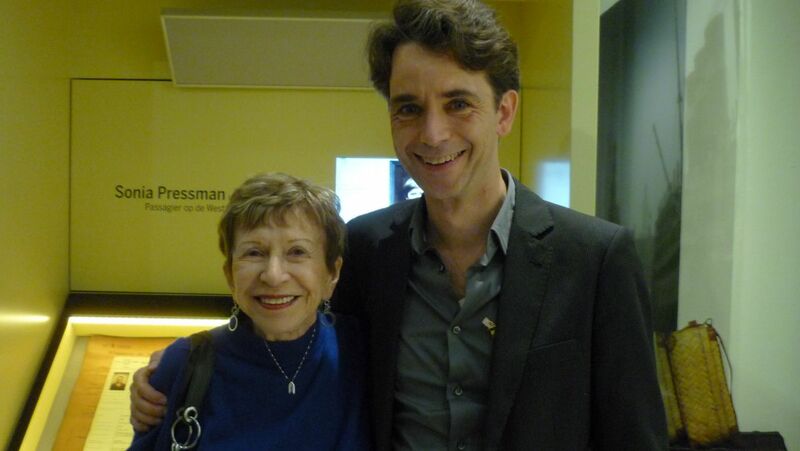 Video of Linda Emmet, one of Irving Berlin's three daughters, and Sonia speaking in connection with the opening of the Red Star Line Museum. "Antwerp museum honours ‘Red Star’ immigrants," Euronews, September 25, 2013. This three-minute film was made by Mario De Munck for the Red Star Line (RSL) Museum and is part of the Museum’s exhibit about Sonia and her family. Hover over the video to reveal the controls. This film, shown on Polish TV, is in Polish, but the photos are worth seeing.